Our Children’s Ministry includes kids of various ages and fits whatever needs they have. We offer the sacrament of Baptism to everyone — both kids and adults. Anyone interested should speak with the pastor. Children can receive the sacrament of Holy Communion, coming forward to receive the bread and the wine or grape juice. If a child does not wish to receive Communion, she or he is still welcome to come and receive a blessing. And we periodically schedule instructional classes on Holy Communion. Confirmation (Affirmation of Baptism) is offered to young adults who have completed a period of instruction and exploration of their faith. Kid’s Time is usually held during part of the worship service. Children go with their teacher to a classroom for a lesson and/or craft. Second Sunday School is held on the second Sunday of the month from 3:00 until worship time. There is a class for both kids and adults. 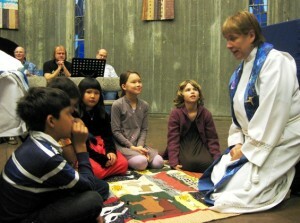 Children are encouraged to participate in the worship service itself, in age-appropriate ways. They may serve as readers, candle-lighters, and Communion assistants.